Getting boyfriend birthday wishes just right doesn't have to be hard. But it shouldn't be too easy. Besides, your boyfriend will appreciate the time and effort you put into choosing from birthday greetings here. Finding the right birthday wishes for boyfriends will be much easier for you (and so special for your boyfriend) with the birthday messages on this page, which have all the right ingredients: passion, honesty, humor, appreciation and, most importantly, love. In theory, boyfriend birthday messages should be romantic. Of course, in reality, they can be romantic and inspirational, funny, clever, whatever you want, as long as the "romantic" quotient is high. The mushy stuff must stand out. So what's the perfect route for you and your boyfriend? The perfect birthday wish for your boyfriend will make him act like a modern-day Romeo or, at the very least, give his inner Casanova new life, making you his Juliet (minus the sad ending). Choosing the perfect birthday wish for him may seem like a hard thing to do but it's actually easier than you think. How should you go about picking the right one? Is he romantic? If not, pick boyfriend birthday wishes that are light on romance. If he is romantic, go crazy with the mushy stuff. Is he insecure? If so, pick a message that plays up the "I Love You" part. Is he super smart? If so, be clever with your boyfriend birthday wishes (but remember that you don't have to use "$64,000" words to be clever). Does he have a sense of humor? If so, you can be lighthearted but he will probably like a romantic message more. Does he need some encouragement? If so, throw in some inspirational words. That can actually be very romantic (especially for guys, who can't resist a compliment). Happy birthday, sweetie! Every day (not just your birthday), I think about you and how incredible you are. If you were not here, my days (even my birthday) would feel so empty. Every second, my love for you grows. By the time you finish reading this message, my love for you will be tenfold. Happy birthday, my love! You're my favorite person in the world...and your birthday is my favorite day of the year. Happy birthday, honey! Happy birthday! I can’t tell you how much I love you and how wonderful I feel when I’m with you, especially on your special day. Oops, I guess I just did! Happy birthday, lover! I love you 1,586,383 times more today than yesterday, but not 1,586,383th as much as tomorrow. Happy birthday, lover boy! I’m so happy that I get to spend every special moment of your special day with you, the most special person in my life. Happy, happy, happy birthday wishes for my sweetheart! These heartfelt birthday wishes are for you, sweetheart! My day does not start with the sunrise. Nor does my day end with the sunset. Every day starts and ends with you, my dearest love. May your special day start and end with our burning love. Hope you enjoyed these loving words. Happy birthday! I love you! 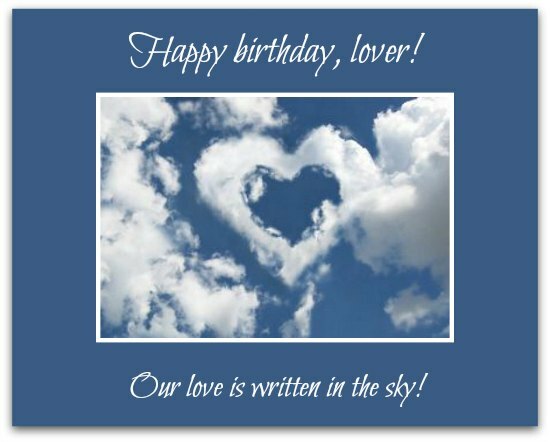 Happy, happy, happy birthday wishes for my lover! This crazy love in me. This crazy love is you. Hope you loved this poem, as much as I love you. And that's with all the fire in my heart. You've definitely proven that you're boyfriend material. You're kind, loving, gentle, strong and, best of all, you're mine. Happy birthday, sweetheart. The best gifts I ever got weren't even on my birthday. It was when I met you. It was when I fell in love with you. It’s every day I get to love you. So my gift to you is my love. Feel free to unwrap it anytime. I never expected a boyfriend like you. Everything about you is truly wonderful. You are incredibly special. Let's make your birthday as wonderfully special as you are (yes, you should read between the lines here). What does your boyfriend want to hear from you? Recently, I checked out Redbook article on what boyfriends want to hear. The magazine actually came up with 18 different "sweet nothings" you may want to see. Interested? If so, click here to read the article. I can’t be with you on your birthday, so I’m sending you all the hugs, kisses and love in my heart for all the times you miss me. Happy birthday, sweetheart! Happy birthday, my love! It may take just a few moments to write “I love you” but I spend every moment of every day loving you…and I can’t wait to spend the rest of my life doing the same. Your Facebook page may be full of birthday wishes from many friends and family but mine is the only one that comes with oodles of hugs, kisses and love. Happy birthday, my prince! Want to look at more messages? Happy birthday. Wherever we are, that’s where I want to be, right next to you. It’s my favorite spot in the world. Happy birthday, my dearest. The next to best thing I ever did was falling in love with you. The best is being in love with you. There are good days and there are bad days. Every day with you is not a good day — it’s the best day ever, especially your birthday. On your birthday, I know you’ll be getting LOL…Lots of laughs, lots of luck, lots of love and, most of all, lots of lovin’. How do I know? Because I’ll be giving it to you! Together, apart, I’m always deliriously happy and deliriously in love with you. Why? When you’re not in my arms, you’re in my heart. You’re always with me. Happy birthday, sweetkins! When I think about you, I think I know what love means. When I’m with you, there's no doubt in my mind. Wishing you a birthday full of the love I feel for you, multiplied by 1,000,000,000.